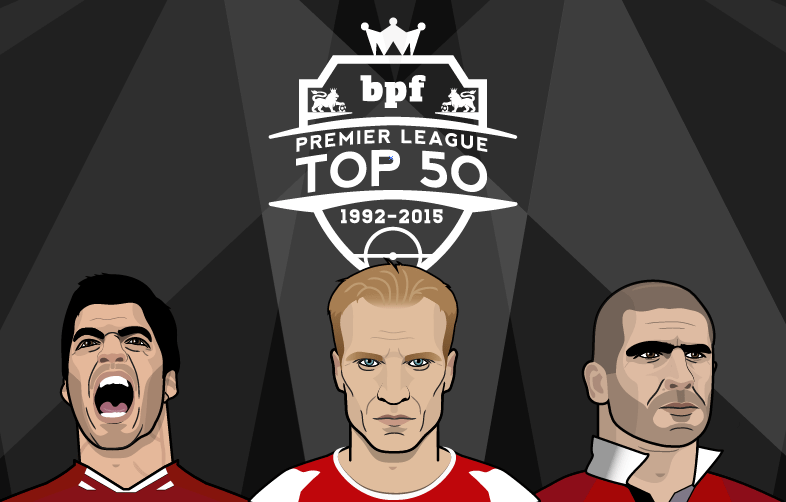 The BPF Top 50 feature is back for 2015, and this time we are counting down the greatest players to have graced the Premier League since it was established in 1992. We’re now heading towards the business end of the countdown, and out of ten players previewed in this part, only one has played for more than one team in the English top flight. View the longlist and voting process here. During his illustrious Premier League career, Frank Lampard soon became synonymous with the simple act of putting the ball in the back of net, but at the very highest level and with an unrivalled record among midfielders. Lampard began his career with local club West Ham, for whom his father Frank Lampard Sr. also played for. I’m telling you now, he [Lampard] will go right to the very top. Right to the very top. ’Cos he’s got everything that is needed to be a top midfield player. His attitude is first-class. He’s got strength, he can play, he can pass and he can score goals. Nearly twenty years later, Redknapp’s prediction has truly come to fruition with Lampard now regarded by pundits, managers and teammates as one of the greatest midfielders of his generation. Lampard’s breakthrough season for the hammers came in 1997/98, amassing 42 appearances and a notable nine goals, recovering admirably from a broken leg suffered in the second half of the 1996/97 season. He was also an ever-present the following season, which saw West Ham record their highest-ever league placing in fifth, thus securing qualification for the much maligned Intertoto Cup. The goals continued to flow for Lampard in the subsequent season, finishing as West Ham’s third top scorer, behind Paolo Di Canio and Paulo Wanchope, with a total of 14 goals in all competitions. Yet the next season proved to be Lampard’s last in East London as West Ham finished a paltry 15th place. Lampard still notched nine goals in his 37 outings that season, behind only Frédéric Kanouté and Paolo Di Canio in the West Ham scoring charts. However, when Harry Redknapp and assistant Lampard Sr. left the club by mutual consent, Frank followed and made the decision to join London-rivals Chelsea for £11 million. Lampard would go onto establish himself as a legend at the West London club, becoming the Chelsea’s all-time top goalscorer with a quite remarkable 211 goals from midfield. During his 13 seasons at Stamford Bridge, ‘Super Frank’ fired Chelsea to three Premier League titles, four FA Cups, two League Cups, a UEFA Champions League and a UEFA Europa League. The list of individual accolades are tremendous, including runner-up in the 2005 Ballan d’Or to none other than Ronaldinho. Lampard was also awarded the 2008 UEFA Midfielder of the Year, Premier League Player of the Season and England Player of the Year in two consecutive seasons (2004/05 and 2005/06) as well as Chelsea’s Player of the Year three times. On the international front, Lampard won his first full cap for England in 1999, going on to win 105 more and in October 2015 he received an OBE for his services to football. Surprisingly, Lampard was released by Chelsea at the end of the 2013/14 season and signed a non-binding commitment to join New York City FC. However, much to the displeasure of NYCFC fans Lampard would spend the entirety of the 2014/15 season at Manchester City, famously scoring against former club Chelsea to level the game in the dying moments at the Etihad. Now in the twilight years of his career, Lampard has continued his knack of scoring goals from midfield, three in ten for NYCFC, as they finished a place outside for the MLS Cup Playoffs. In a career that spanned more than 20 years, accumulating in over 700 appearances for both clubs and country. Schmeichel is best remembered for his time at Manchester United, whom he captained to the 1999 Champions League to complete the famous Treble, and for winning Euro 1992 with Denmark, saving Marco van Basten’s penalty in the semi-final. Prior to moving to Manchester for a fee of £530,000, a fee which Ferguson would later describe as the ‘bargain of the century’, Schmeichel picked up three Danish title during a four year spell at Brondby and also helped them reach the semi-finals of the UEFA cup losing out a to a last minute goal by Rudi Voller of Roma. During his United career Schmeichel won ten major trophies, starting with their first title triumph in 26 years during the 92/93 season and ending with their historic, treble-winning Champions League success in Barcelona in 1999. The Dane was crucial to United’s success and as the footballing cliché and one that Gary Neville often says on MNF, a good keeper can win you seven or eight points a season but in Schmeichel’ s case he probably won United double that. Some of the saves he would make could only be made by him and nobody else; his starfish save from Zamorano in the 1999 Champions League, the penalty save against Arsenal, his continuous denial of Newcastle United at St. James’ Park are all moments that stand out when you mention his name. Schmeichel didn’t just command his penalty area; he ruled it with an iron fist, accepting nothing less than perfection from the players in front of him his saves were almost always followed by vicious verbal screaming for the defenders who had failed to prevent the chance. One of his most impressive technical qualities was his one-on-one shot-stopping, narrowing angles and emphasising his massive 6ft 3ins frame between the goal posts. But that quality wasn’t only just physical, he was constantly at the forefront of his opponent’s head and, as a result, very few ran in on Schmeichel with any belief. The assumption was always that Schmeichel would win those contests; he knew it, the crowd knew it and, most importantly, the player trying to beat him did too. United had won silverware and finished in the top two in every one of Schmeichel’ s season and his importance to United was enlarged after he departed for Sporting Lisbon after the treble-winning glory in 1999. Three third-placed finishes in four years between 2001 and 2005 highlighted just how much he was missed by United and it wasn’t until the arrival of Edwin van der Sar six years after his exit that Manchester United satisfactorily replaced him. Schmeichel was a tour de force, an immeasurable presence at the heart of the great Manchester United teams of the 90s. Given that Schmeichel is so synonymous with that era, it seems wrong to think that he only spent eight years at Old Trafford. Nevertheless though, in less than a decade he made himself the Premier League goalkeeper for the ages, the yardstick against which all of the Premier League’s best have and will continue to be measured. However distant a reality it may now seem, Arsene Wenger used to be able to spot a player. At a time when Arsenal’s title-starved fanbase seems increasingly irritated by the French manager’s stubborn refusal to add the components needed for sustained success, Wenger’s former prescience seems an especially fond memory. No player better encapsulates that ability to mould a quality finish from raw materials than Patrick Vieira. For all Thierry Henry’s magnificence over the course of eight glittering campaigns, it was Vieira, not his expensively recruited compatriot, who gilded a legacy upon which Wenger still stakes his reputation. As a rangy 20-year-old, he would be plucked from the obscurity of AC Milan’s reserves and excel almost instantly. In the roiling chaos of the Premier League’s midfield charnel houses, Vieira provided the snarling intensity that his manager craved, its absence felt more keenly with each passing year. If Roy Keane might press an especially strong case to be considered the finest midfielder of his generation, then Vieira’s presence must surely serve as a mitigating factor. While their ages differed, their careers, defined by the series of cacophonous clashes that came to dominate British football, overlapped enough to give rise to a serious debate that is essentially unwinnable. Like his Irish nemesis, Vieira enjoyed multiple domestic successes as the heartbeat of, arguably, the Premier League’s finest ever team. Vieira’s peak years took in every one of his nine seasons at Highbury. From 1996 until his departure for Juventus in 2005, he formed the heartbeat of a halcyon era marked by three league titles, four FA Cups and a position at the peak of the English game (not to mention his World Cup and European Championship successes with France). As a footballer, the Senegal native stood mighty in the fray, his elegant style and beautiful technique contrasting sharply with the ferocity that drove him ever onwards. In a collective that became known for its aesthetic brilliance, Vieira brought with him the streak of darkness that only born winners can ever truly possess. It speaks volumes when, in the players’ tunnel, just the sight of an opponent or team-mate can win/lose the game before the first whistle. Roy Keane had that aura – his playing ability, ruthless aggression and leadership qualities packed into a 1.78m frame. The Corkman was a player who could strike fear into the hearts and minds of his opponents. Simultaneously, he also boosted the confidence and hunger of his team-mates, ensuring they always kept their standards high and never gave up. After being rejected time and again for being “too small”, Keane earned his lucky break when his performances attracted the attention of Nottingham Forest, then managed by the legendary Brian Clough. During his years at Forest, Keane won just the one title – the Full Members Cup in 1992, beating Matt Le Tissier’s Southampton in the final. What was important about that time period is his development as a footballer. Keane signed for Forest in 1990, aged 19, and left the City Ground in 1993 as a man ready to break into the upper echelons of the beautiful game. Few players are privileged to work with not one but two legendary managers. With hindsight, Keane left one legendary manager in Clough for another in Sir Alex Ferguson. Paul Ince and Bryan Robson – one of Keane’s heroes – were Manchester United’s midfield fulcrum. The then-British record of £3.75 million that Manchester United had spent on Keane perhaps could have been spent elsewhere. In his first season, Keane helped United win the league and cup double. Another double soon followed in 1995/96. After Cantona’s retirement in 1997, Ferguson handed Roy Keane the armband. When the Irishman left Old Trafford (under acrimonious circumstances) in January 2006, the record fee he cost looked like small change. It could be compared to the £1 million spent on Eric Cantona. Cantona had sparked the great era of success at Old Trafford. Keane, with his captain’s armband on, took that baton and ran with it. As Manchester United captain, the hot-headed Irishman led his side to one title after another. His list of team honours reads – seven Premier League titles, four FA Cups, one Intercontinental Cup (Club World Cup) and one Champions League. His frequent skirmishes with Patrick Vieira was arguably the highlight of the Premier League during that time. A polarising figure, Keane remains without doubt one of the greatest captains in the history of Manchester United and English football as a whole. Individually, he was named into the PFA Team of the Year on five occasions as well as the Premier League’s Overseas Team of the Decade (1992/93 to 2001/02). He was also named the PFA Players’ Player of the Year and Football Writers’ Association Footballer of the Year in 2000. Keane had innumerable noteworthy games in the Premier League, yet his performance in United’s semi-final games against Juventus in their treble-winning season stands tallest and shines brightest. The darkest blemish on Keane’s career is his intentional over-the-top challenge which ended Alf Inge Haaland’s career. He also left United under the dark cloud of heavy criticism of his team-mates. It is fitting that the fire which made Roy Keane a magnificent player and leader was also the cause of his downfall. We are often taught as children to not play with fire. Well, Roy Keane played with fire and won. Old Trafford, May 6, 2014. Manchester United entertain Hull in the penultimate fixture of the season. Forty-year-old Ryan Giggs stands over a free-kick 25-yards from goal in injury time. Having been put in charge of the team for the last four games of the season following the dismissal of David Moyes, the Welsh legend brought himself on as a substitute for what would be his final game as a professional footballer. The poignancy of the moment is not lost on the Old Trafford faithful: “Keeper let it in, keeper, keeper, let in”, the home fans implore Hull goalkeeper Eldin Jakupovic to allow their hero one final moment of glory. They are well aware that this represents the last chance for Giggs to keep up his record of having scored in every season of the Premier League since its inception in 1992. But Jakupovic proves to be no sucker for sentiment as he parries Giggs’s goal-bound effort out for a corner. And there ended the most glittering career in modern football. A career that spanned almost a quarter of a century at the highest level. 963 appearances for Manchester United, 168 goals. 64 caps for Wales. 13 Premier League titles, four F.A. Cups, two League Cups, and twice a Champions League winner. Incredible. It’s well known that Giggs’s story is one of consistency and longevity — evidenced by the fact that 16 years separate his double win of the PFA Young Player of the Year in 1992 and ’93, and his successful balot for the senior version of the award in 2009. However, when reflecting upon Giggs’s storied career, it would be remiss to give insufficient credit to the characteristic that made such longevity possible: his adaptability. From the moment he made his debut against Everton in March 1991, the young Giggs set himself apart with his balance and speed. As a pacey left-winger, he had the ability to dribble past several players at once, changing direction without breaking stride. [Giggs] floated over the ground like a cocker spaniel chasing a piece of silver paper in the wind. His playing style, coupled with his status as the Premier League’s first poster boy, drew inevitable comparisons with Old Trafford legend George Best. Giggs would go on to be the automatic first choice for the left side of United’s midfield for the rest of the ’90s and into the new millennium. He was an integral part of several championship winning sides, including the great Treble winners of 1999 — his incredible solo goal against Arsenal to settle the F.A. cup semi-final replay is an obvious highlight. But around the mid-2000s, having lost some of his trademark pace, Giggs found himself on the periphery of the starting XI. Usurped by the likes of Cristiano Ronaldo and Nani as first picks in the wide positions. Yet rather than rest on the laurels of an already legendary career, Giggs chose not to settle for a supporting role: he chose to adapt. The Welshmen carved out a new role for himself as the experienced head in the centre of United’s midfield, picking the opposition apart with nouse and precision passing, rather than speed and acceleration. By changing with the times, Giggs remained relevant through three decades. His legacy is one of untold success and loyalty, the likes of which may never be replicated.